It’s well known that personalities can shift and change when we are ‘under the influence’ of chemicals, be it drugs or alcohol. As entomologists, we also consider this question for the insects and spiders that live among us: although we assume arthropods can similarly be affected by chemicals in their environment, it’s less clear how these chemicals may affect the personalities of these arthropods. We tested the effects of insecticide residues on the personalities of a jumping spider known to live in apple orchards. We found that individual-based personality shifts occurred when spiders were exposed to sub-lethal doses of an insecticide. This mean that even before we might see ‘population-level’ effects of insecticides on an important predator in agro-ecosystems, individual spiders themselves get, um, sort of messed up when under the influence. Insecticides are often used in agriculture for various reasons, but can have negative effects on the ‘non-target’ fauna living in our agricultural fields. One of the most important challenges in evaluating their toxicity is that these chemicals can persist at low concentration in the environment. These concentrations are unlikely to kill exposed organisms but may substantially alter behaviours. Most of our evidence of the toxicity of insecticides on behaviours comes from studies on pollinators and research has shown decreases in spatial memory and learning capacities. There remain gaps in our knowledge about how other types of organisms respond to these compounds. Studies on insecticide toxicity may be also limited because they tend to ignore how insecticides shape variation in behaviour. This is important because individuals differ in their behavioural tendencies and may not have the same weight in ecological processes: some individuals are more active, show more aggressiveness or consume more food. Personality traits can also be inter-related and form “behavioural syndromes”: clusters of behavioural traits that are correlated and evolve as a package. If personality traits are interconnected, any insecticide modifying one trait is likely to alter the whole syndrome. We’ve shown previously that behavioural syndromes differed between populations exposed and unexposed to insecticides in the Bronze Jumping Spider, a species common in apple orchards and known to prey on several economically important pests. But those populations could be different for a variety of reasons: for example, perhaps the insecticides affect spider behaviours because there is simply less food available in insecticide-exposed areas for example. We wanted to test if insecticides could be directly responsible for the shifts in personality and behavioural syndromes we noticed. In other words, when a spider is “under the influence” of insecticides, is it still behaving according to its personality type? The similarities between insecticides and drugs is fascinating: Both types of compounds target the nervous system, both can affect behaviours and both can kill above a certain lethal dose. In fact caffeine and nicotine evolved as natural plant defenses against insect herbivory and the latter was one of the first insecticides ever used. As crazy as it sounds, the effect of psychoactive drugs has been investigated in spiders in the past! The legend goes that, back in 1948, zoologist H. M. Peters was annoyed by his garden spiders spinning webs at “such ungodly hours” (2 am-5am). He wanted to found a compound that would shift the spinning behaviour to more a “decent” schedule, and he asked pharmacologist Peter N. Witt for help. Witt tried different psychoactive compounds on the spiders, including caffeine, LSD and marijuana but couldn’t produce the desired effect. What he found was in fact much more interesting: each compounds produced a distinct type of “drug web”, altering its shape, size or regularity ! (from Foelix’s “Biology of Spiders”) More recent research has shown that some commonly used insecticides affect web building in the same way drugs do. 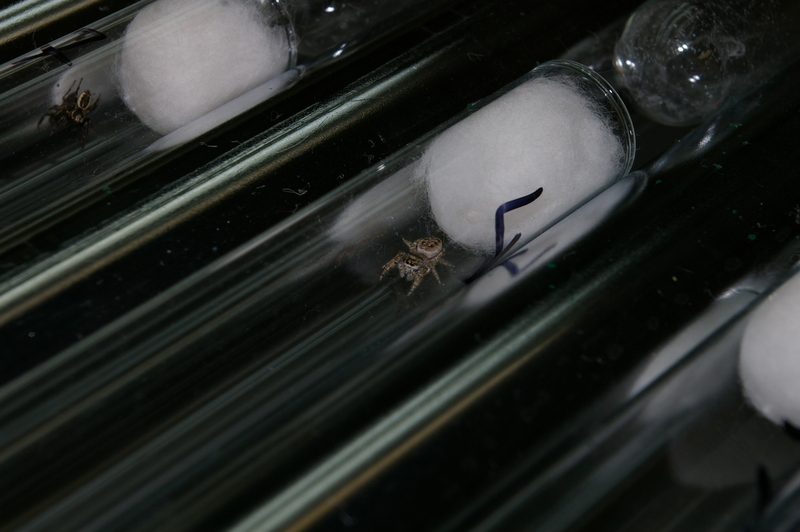 We focused on how activity and prey capture capacities were affected by exposure to a widely used insecticide (phosmet) in the Bronze Jumping Spider. We tested activity and prey capture before and after exposure the insecticide and compared the amount of behavioural variation with that of a control group. Doing research in ecology sometimes requires using original equipment. 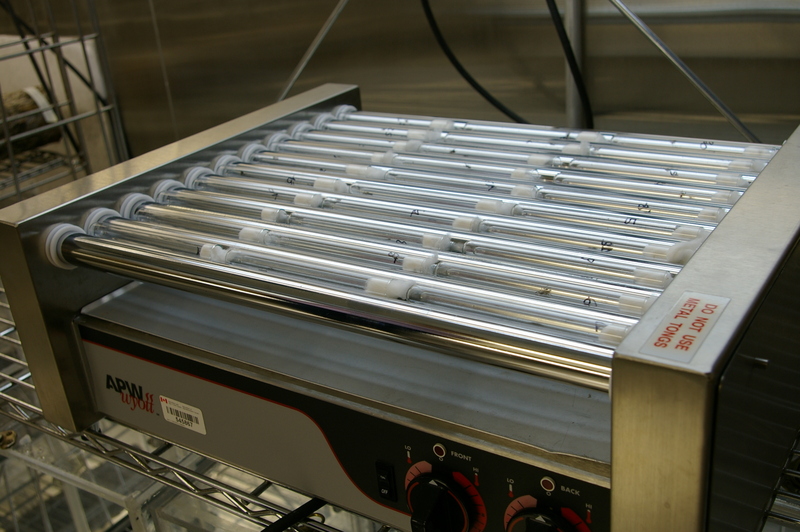 In our case we found that the best way to expose our spiders to the insecticide was to use a hotdog warmer! We applied the insecticide solution on test tubes and used the rotation of the hotdog machine to get a homogeneous surface coated with dry insecticide residues. This allowed us to have a more precise control of the dose that each spider received while simulating field exposure conditions. We did not found any effect of the insecticide on average behaviour between treatments but the ranking of individuals was strongly affected after insecticide exposure. In general spiders exposed to the insecticide were more variable in their behavioural tendencies. This suggests that the effects of insecticides on personality differences may manifest before any effects on the population as a whole are detected, in which case scientists may be frequently underestimating the toxicity of insecticides. Another puzzling result was that males and females did not respond in the same way to insecticide exposure. Males were most affected in the way they explored their environment but their capacity to capture prey remained intact. Females instead showed a decrease in the strength of the activity-prey capture syndrome. Spiders play an important role in agricultural fields as they help regulate pest outbreaks. By altering personality differences and their syndromes, insecticides may limit spiders’ capacity to provide this important ecosystem service in subtle ways. As usual, this research leads to more questions than answers. At the organism’s level, it is important to understand how long these personality shifts last for. Do these shifts vary depending on how frequently spiders get exposed to insecticide or to what types of insecticides they are exposed to? How do they ultimately affect a spider’s capacity to escape predators, capture prey or reproduce depending on the individual’s personality? At the ecosystem level, prey get exposed to insecticides too, what happens to the predator-prey dynamics when the personality of both prey and predator is affected? How does that translate into biocontrol services? These are all important questions that I hope to contribute to in the future. Stay tuned! A male bronze jumper (Eris militaris). Photo by C. Ernst, reproduced here with permission. Rainer F. Foelix (2010). Biology of spiders. Oxford University Press. p. 179. 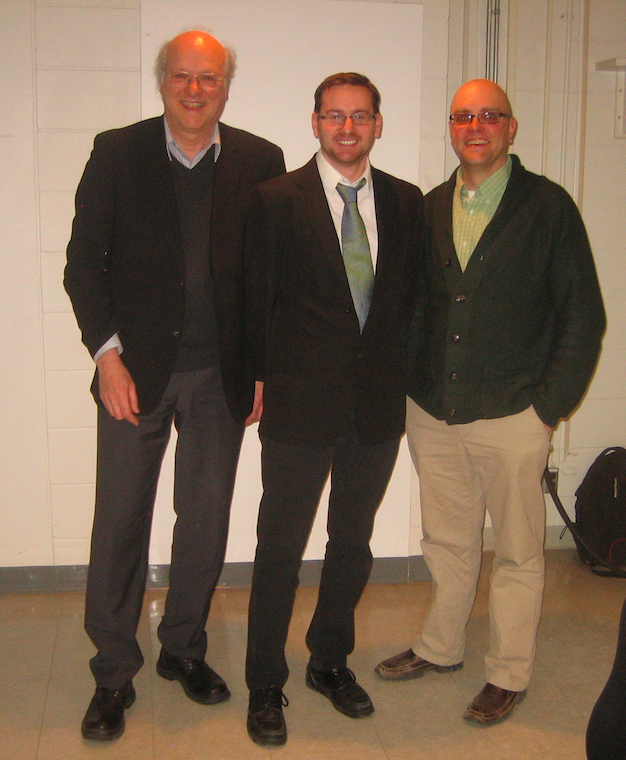 I’m delighted to announce that lab member Raphaël Royauté successfully defended his PhD yesterday…. and he did it with grace, maturity, and poise. The defence was fair, but tough, and Raphael was able to show his breadth and depth of expertise on the broad topic of behaviour in arthropods. Raphaël’s thesis was titled “Factors influencing behavioural variation in apple orchard populations of the jumping spider Eris militaris (Araneae: Salticidae)” and the during the defence, he was asked (not by me, remarkably!) to offer a ‘tweet’ of the his thesis. Here it is, coming in at almost exactly 140 characters. Raph’s thesis, in a tweet. 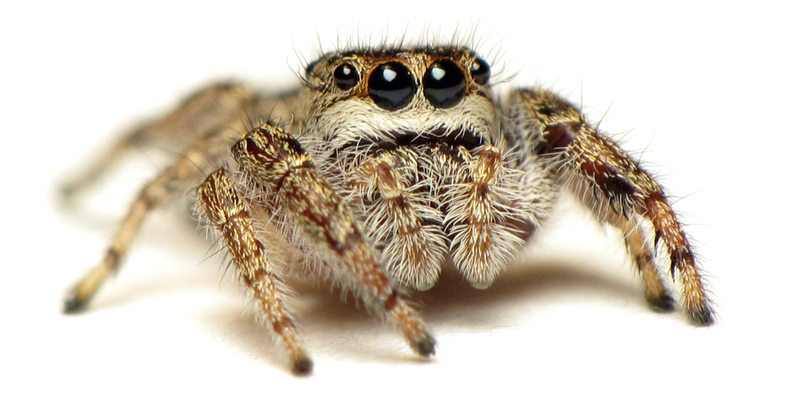 So, his research looked at behavioural syndromes in this remarkable jumping spider: Raphaël collected spiders in apple orchards, maintained them in a laboratory and ran them through a battery of behavioural test. He defined behaviours, looked at correlations among these behaviours (sometimes called ‘personality’), and how these traits varied during the development of individuals, consistency of these behaviours and whether behaviours differed depending on whether the spiders came from insecticide-free on insecticide-treated orchards. Raphaël also looked at the direct effect of sub-lethel effects of insecticides on behaviour and will soon be publishing the ways that insecticides mess up their personalities. Raphaël has really done incredible work – but looking back, I should not be surprised. 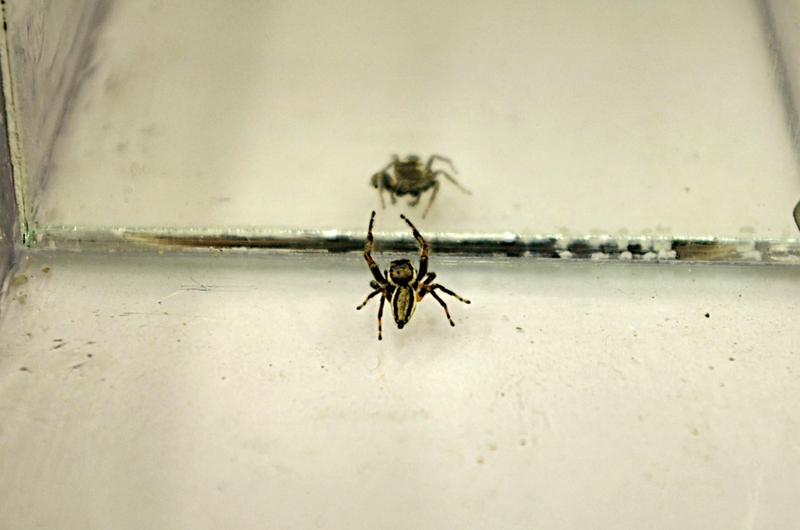 Soon after he arrived in the lab we worked together on a short project about the activity of spiders right after snowmelt, at at that point, I was impressed with his intellectual curiosity, drive and motivation, and overall approach to scientific research. After that first project, Raphaël came back to McGill to work on a PhD with me and Dr. Charles Vincent as co-supervisors. And now, many years later, he is now successfully defended a PhD. What a marvellous journey, and I can honestly say that I’ve learned far more from Raphaël than he could have learned from me. This post was written by C. Buddle and R. Royaute (a PhD student in the Arthropod Ecology lab). Agriculture has strongly intensified in the last 60 years, causing major concerns the sustainability of biodiversity. Agricultural practices can reduce habitats available for wildlife and also release toxins in the environment through the use of pesticides. Not all organisms living in agricultural fields are harmful, and many predators, including spiders, can help to reduce pest density. We have a relatively good knowledge that the diversity of spider species in agriculture, especially under our temperate latitudes, can help reduce pest damage. However, many of the factors that influence spider predation on pests depend on the outcome of behavioural interactions and we don’t know much about that topic. Spiders are often cannibalistic and aggressive with one another and these types of behaviours may limit their efficiency for pest control. We also need to understand if these aggressive tendencies vary depending on the type of agricultural field considered, a pesticide treated field may favour very different behaviours than one that is managed organically. Another important point is that populations are composed by a multitude of individuals, each with its own behavioural tendencies. Some individuals take more risks when confronted with predators (i.e. they are more bold), others are more active and explore larger areas or consume more prey. These tendencies – often referred to as personality traits – may also be correlated with one another. We collected spiders from pesticide-treated and pesticide-free orchards, brought them back to the laboratory, and did a number of behavioural tests on the individuals from the two populations. Compared to the insecticide-free populations, we document that individuals from orchards that did receive insecticides experienced a shift in their behaviours syndromes. The overall shape of this syndrome is multidimensional, but it suffices to say that the correlations among different behaviours (the ‘syndromes’, otherwise known as the ‘personality’) differed depending on where the population came from. 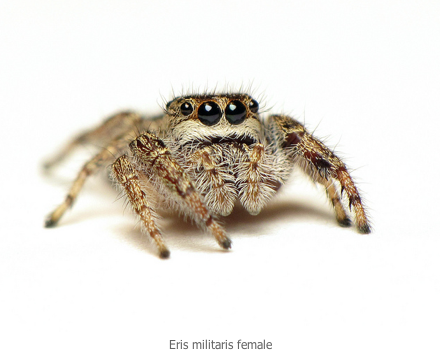 In sum, the personality shifts that we documented for E. militaris are potentially quite important since the relationships between different behaviours may affect a spider’s ability to be an effective generalist predator in apple orchards. We need to consider how management (including use of insecticides) may affect specific behaviours, and more importantly, the relationships between the different behaviours. 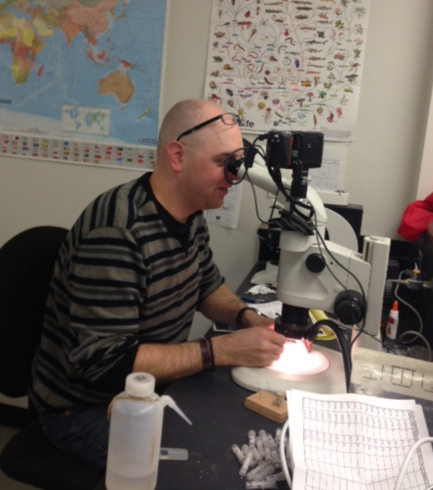 Last week my laboratory attended the Entomological Society of Canada’s annual meeting, held in Guelph. I was so proud of the whole lab – we had an impressive showing at the meeting, and I was especially impressed with the three undergraduate students who presented their research to Entomologists from across Canada. Wow – I don’t think I had that amount of confidence when I was an undergrad! I am THRILLED to announce that three arthropod ecology students were recognized for their excellent presentations. Second, PhD student Dorothy Maguire was the runner up in the the same Biodiversity section. Her oral presentation was on Insect herbivory in fragmented forest landscapes: linking land use with changes in biodiversity and ecosystem function. Dorothy is co-supervised by Elena Bennett. Here’s a photo of Dory doing what she loves! 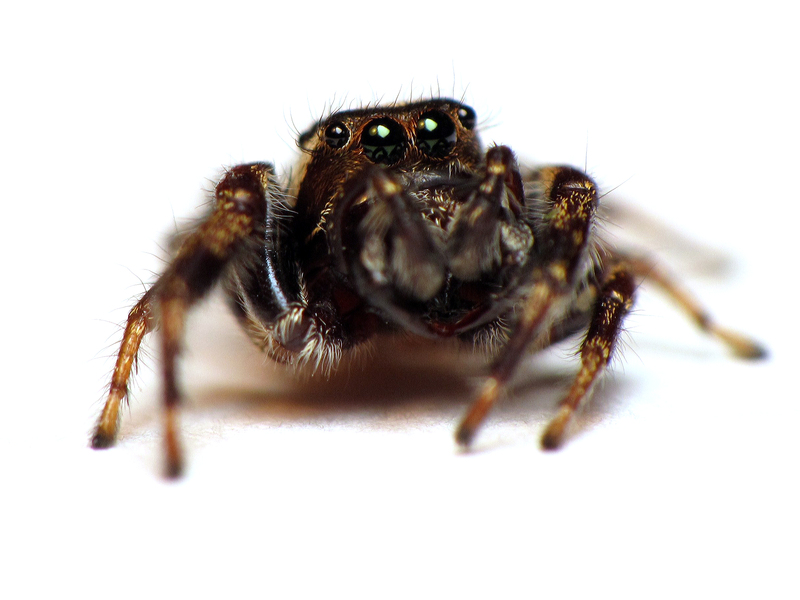 Finally, PhD student Raphaël Royauté was runner up in the student poster competition, for his work titled Does physiological state affect individual variation in boldness in a jumping spider? 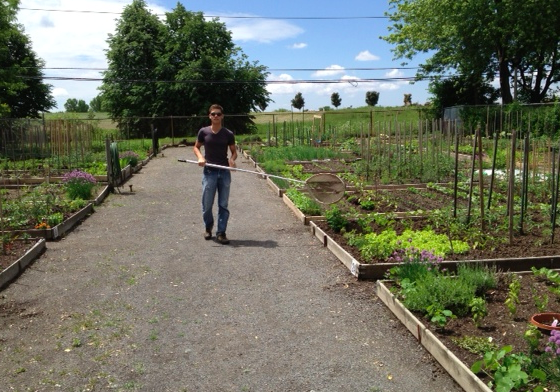 Raphaël is co-supervised by Dr. Charles Vincent, from Agriculture and Agri-Food Canada. Here’s an older photo of me and Raph, not long after he first came to the lab for a short internship. Raphael (left) and Chris (right), working hard. The academic term is over, and so are my teaching duties (until September). This is the time of year that I sometimes get asked how I am going to spend my summer off from work. Many people think that Professors teach University classes and then sit back and relax for four months every summer – Oh, we may wander in to work now and then, do some ‘critical thinking’, muse poetically about society and our place in it, but by in large, the summer is for leisure time, long lunches, vacation, and recovery after that tough eight months of teaching. For a Professor at a University with a research focus in addition to teaching duties, the summer is for making significant progress on research. For a field biologist, such as myself, summer is often the busiest time of year. Studying animals outside (in Northern countries) means that we must cram a lot of work into four short months! Quite often we also work on grant applications (many of these are due in the early Autumn), and without grants, our research programs will fail. Yes, the summer offers some flexibility, but it certainly isn’t all leisure – a lot of work must get done and the expectations are high. 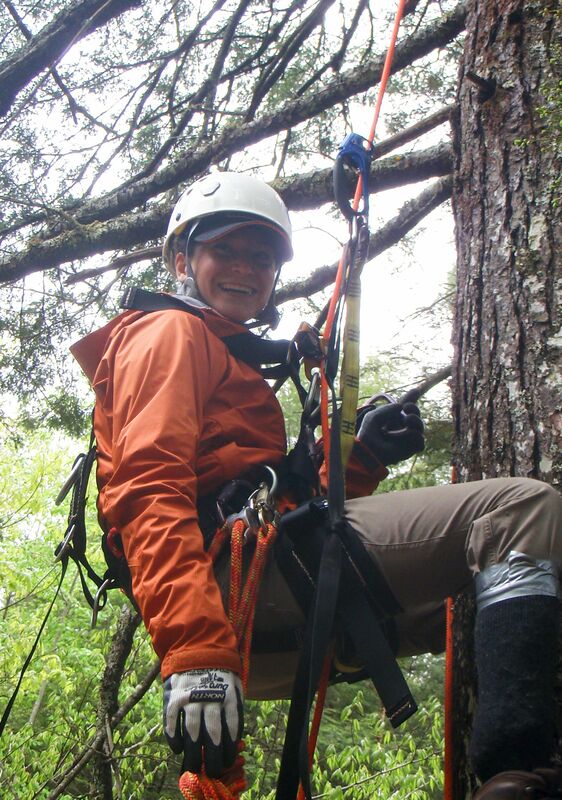 In my laboratory this summer, Dorothy Maguire (who did pass her comprehensive examination successfully – congratulations, Dorothy) will be doing her second summer of field work on her PhD project about the effects of forest fragmentation on hebivory (by insects) in the Montérégie. This project is done in collaboration with Dr. Elena Bennett’s research team (and Elena is Dorothy’s co-supervisor). This work is very exciting and novel, in part because Dorothy is putting this work in the context of “ecosystem services” -i.e., the various services that humans get from ecosystems. 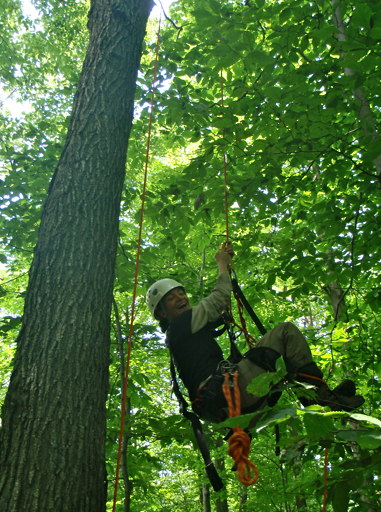 Insects feed on trees, and trees are valuable to humans, so the linkages between insect herbivores and ecosystem services are important to study, especially in the context of fragmented forests of SW Quebec. We also have a field team heading up to the Yukon Territory to finish some field collections in the context of the Northern Biodiversity Program. Katie, Crystal, and Laura will be collecting spiders, beetles, parasitoids (& more) along the Dempster Highway (one of the most beautiful places on the planet). Crystal and Raphael laughing about the ‘unknown’ bag of soil. Chris Buddle actually doing laboratory work. Wonders never cease. 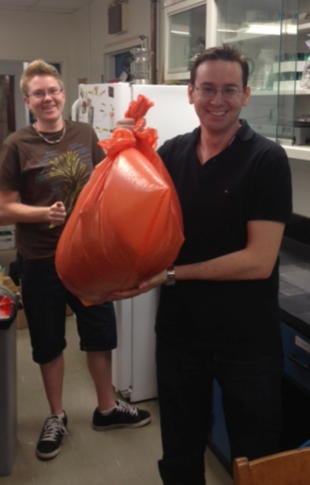 Prof. David Wise, from University of Illinois at Chicago, visited our laboratory yesterday. David Wise is a very well known community ecologist, and is also an influential spider ecologist. On a personal level, David Wise influenced my academic career significantly, and I have long been inspired by his work. His book “Spiders in Ecological Webs” remains an important piece of work (he was also the external examiner for my PhD). David Wise gave a nice seminar in our Department, and I will write a post next week to share some of the knowledge we gained from that and from other interactions with him. Today, however, I have different (fun!) story for you. 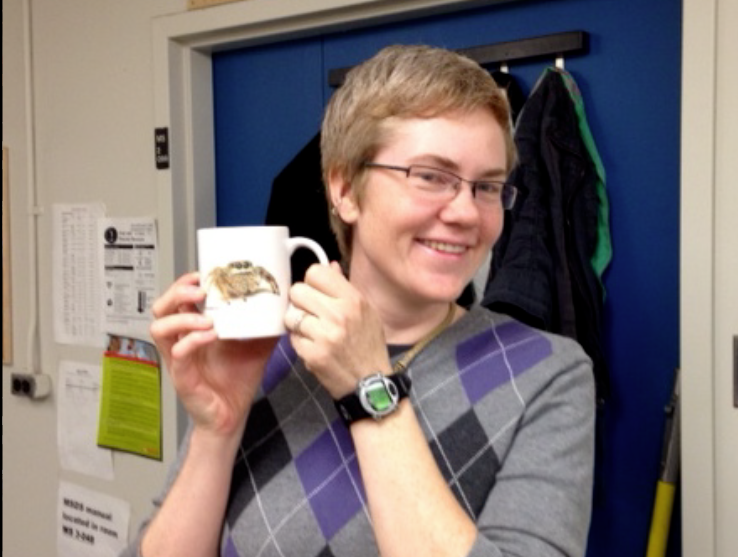 Many of you are aware of “The Bug Geek” (aka Crystal Ernst, my PhD student). In addition to being an excellent scientist, Crystal is a terrific photographer. A few weeks ago, she opened up an on-line shop to sell her wares, including a mug with this lovely picture of Eris militaris on it (by the way, Crystal is doing this in part to help fund her trip to “BugShot2012”. Eris militaris, a jumping spider. Photograph (C) C. Ernst. This jumping spider is the study species of my PhD student Raphael Royaute. I bought one of Crystal’s mugs, and it arrived on Wednesday. Confused, yet? Here’s the recap: Spiders are great, Crystal photographed Raphael’s study species and put the image on a mug, I bought the mug, it arrived (quite unplanned) the day before David Wise showed up in the laboratory. 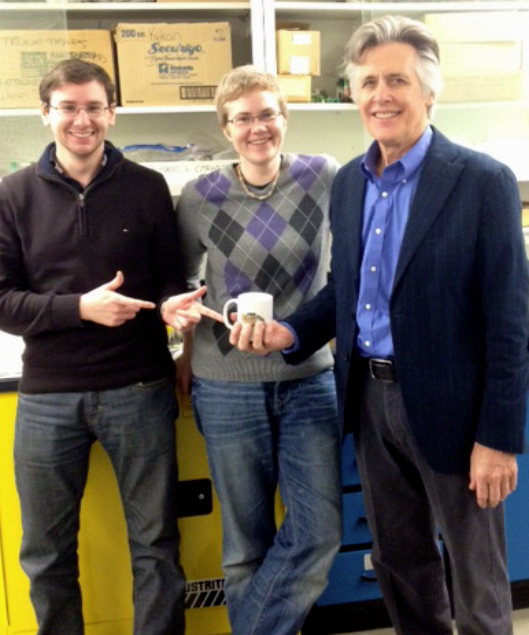 Raphael, Crystal and David Wise, with "The Mug in Question". Raphael studied the effect of distance (i.e., to a forest border) as well as effects of agronomic disturbance (i.e., tilling, planting) on spider assemblages. He also looked at directional movement of spiders by having ‘drift fences’ around pitfall traps – to see whether spiders are moving from the border into the corn fields, or vice versa. Raphael collected over 70 species of spiders with this project, and he found a significant effect of “border”, and has strong evidence that spiders are very active in cornfields immediately after snow-melt. This is something that arachnologists often anecdotally observe, but Raphael’s research provides data to back up the observations. 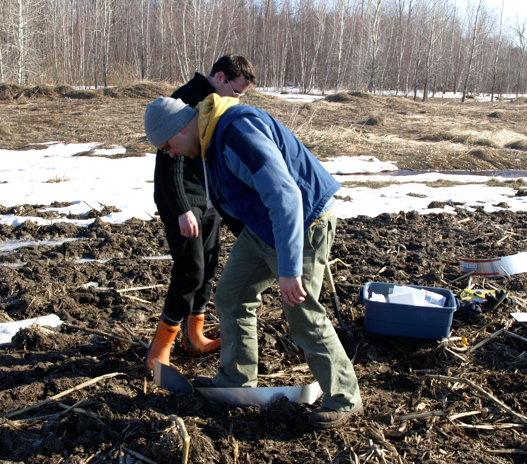 This work, titled “Colonization dynamics of agroecosystem spider assemblages after snow-melt in Quebec (Canada)” is now accepted in Journal of Arachnology and will likely appear in print sometime in 2012.